A posh, suite-only boutique hotel, your better half will know you are giving her only the best for your Montreal couples getaway from the moment you check into luxurious Saint-Sulpice hotel, located right behind Basilica Notre-Dame in hip but historic Old Montreal. And ladies, if you want church bells ringing in his head, you can’t go wrong with this downtown Montreal hotel! Surrounding neighborhood of Old Montreal will ensure you feel transported to another world for your romantic getaway, offering a unique combination of old-world charm and hip party locations. Great location for activities from day to night. Spend a day strolling along the St. Lawrence River and cobblestone streets, and when your feet are tired treat yourselves to one of the many ambiance-loaded restaurants and bars all within walking distance. 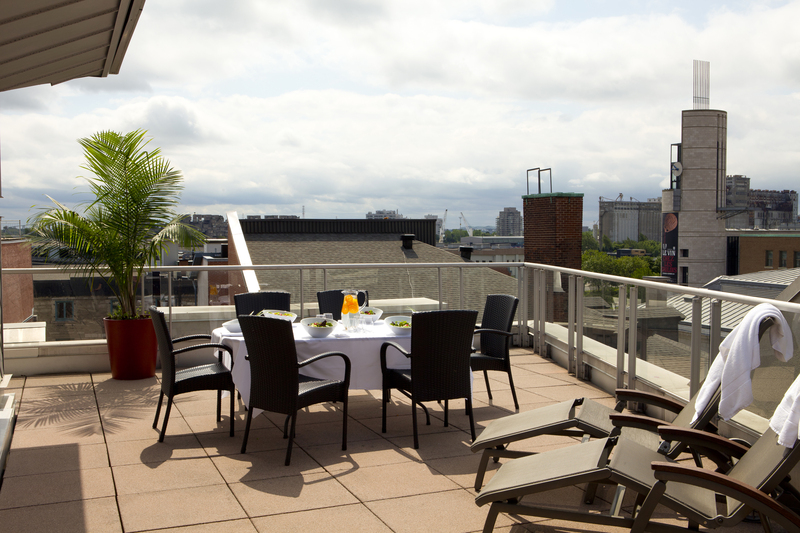 Restaurant Sinclair with elite garden terrasse, an exemplary Montreal patio for summertime. While this elite Montreal hotel may not work for every budget, its suites are roomy and offer comparably great value. Especially if you go with a couples getaway package from us, which include deals on hotel accommodations such as this.